hairulovchessmaniac: Breaking News ! - Mashafizul lost to Norazman Ismail ..by forfeit ! Breaking News ! - Mashafizul lost to Norazman Ismail ..by forfeit ! 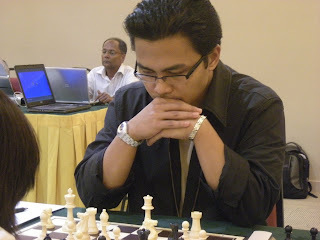 18.2.2008 - Thanks to Mr. MUHAMMAD Arshad for sending me the results of the 2nd round of Pencarian Jaguh Catur Negeri Terengganu (Grand Final) which start today 18th December till 22nd December 2008 . After glancing trough the results, i plan to write a typical early round report which usually about the top seed winning against much lower rated opponents. However i was a little bit confused after reading the 1st table results which show + -- for the game between the 1st seed - IM Mashafizul (FIDE 2439) against Norazman Ismail (FIDE 1821). Curiously, i call the main person of the tournament - Muhammad Arshad to clarify the results and i was quite shock to hear that Mashafizul (photo right) was actually lost by forfeit... for....being more then 30 minutes late ... for the start of the game ! Another interesting things is Arshad who is driving when i call him said that Norazman is actually on his side during the phone conversation!